On 11 June, many friends and supporters of the Burgess Foundation gathered for the launch of our new exhibition at the Central Library, “Manchester Made Me: Anthony Burgess and Manchester”. 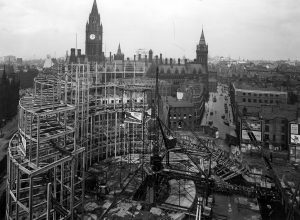 Inspired by Stuart Bolton’s extensive research into Manchester City Council’s Local Image Collection, the exhibition features images from that collection, the Burgess Foundation’s own archive and contemporary photographs to explore Burgess’s formative years in Manchester and reveal the ever-changing face of the city. 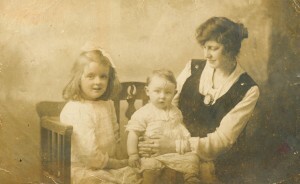 Born in Harpurhey in 1917, Burgess left Manchester more or less permanently in 1940, but it never left him. Manchester was a tough, industrial city, but it had an independent, vibrant spirit and was home, Burgess later said, to the “best orchestra” (the Hallé), “best daily newspaper” (Manchester Guardian), “best pub” (Tommy Ducks), “best zoo” (Belle Vue) and “best jokes”. Burgess’s attitudes to the city were conflicted, but he never escaped its influence: his formative years in Manchester were to remain a rich source of inspiration for his later literature and music. In novels, such as Tremor of Intent (1966), The Pianoplayers (1986), and Any Old Iron (1989), Burgess draws heavily on the experiences of his youth, and his childhood in Manchester features prominently in the first part of his autobiography, Little Wilson and Big God (1987). Among his musical works is A Manchester Overture, completed in 1989, which has strong autobiographical elements. Visitors to the “Manchester Made Me” exhibition are offered a unique photographic insight into Burgess’s early years in North Manchester and Moss Side, his school and university life as a student of Bishop Bilsborrow Memorial R.C. Primary School, Xaverian College, and the University of Manchester, and his early musical influences. His nostalgia for the food of his youth and frequent visits to the Central Library are also explored. The photographic material on display is enriched by copies of manuscripts, typescripts, books, and other items from the Burgess Foundation’s rich archive, including a copy of pages from an incomplete draft of Burgess’s undergraduate dissertation, and examples of his earliest published poems, dated 1935. The exhibition is open until 20 July and is freely available to visitors to the Central Library in the Wolfson Reading Room and first-floor exhibition area. A catalogue has been produced to accompany the exhibition and is available for £5 in the Burgess Foundation shop. With thanks to Stuart Bolton for his invaluable advice and support, and also to the Heritage Lottery Fund, Manchester Libraries, Information and Archives, Manchester City Council, and our hosts at the Manchester Central Library.